This species is only established at one site in Ireland - the vicinity of the Mound at Downpatrick, where it has been known for some two hundred and fifty years. Its status is unclear: although native in Great Britain, where it is relatively common, it may only be an ancient introduction in Ireland. The dots on the map from sites other than the Downpatrick one are records of the plant as non-persistent casuals only. 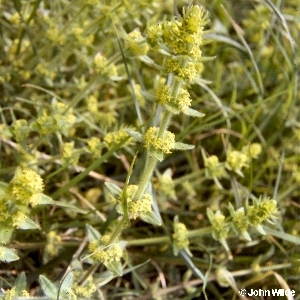 All names: Cruciata laevipes Opiz; Galium cruciata (L.) Scop. ; Cruciata chersonensis (Willd.) Ehrend.